Every fall I stock up on candy corn, for some insanely bizarre reason. Why so bizarre? Because I don't eat it! I don't even like it much, truth be told. Why buy it then? I have no idea. I get this odd compulsion when I see the bags stacked on grocery store shelves... Buy me, the candy corn whispers, You know you want to. Does anyone else listen to those voices in their heads?! No? Just me? How about we forget I said anything, ok? The Hubs... now he can plow through a bag of candy corn in a couple hours. After, he's sick and moaning and complaining, and I rue the day I ever tossed those bags of candy into my grocery cart. And every year, I swear I'm not going to buy it again. Something must be done to stop the cycle! So this year, after giving into the compulsion, I yet again found myself with candy corn in my pantry. This time I took precautions against the Hubs and his compulsion to consume all things sugar. No matter the cost, I wanted to avoid the bellyache I knew he'd contract. So I buried the candy in the far recesses of my pantry, next to some rice cakes, ha! No way he would ever look there. I'd long heard of a mythical recipe, where candy corn could be morphed into tasty Butterfingers. I heart Butterfingers, seriously. I knew I could use the candy corn for good instead of evil, simply by testing this recipe. Why it works, I can't tell you. I'm guessing it has something to do with the chemical composition of the dreaded candy corn, but who cares? These are delicious, and they taste just like the real thing. Best part? There are only 4 ingredients! Naturally, I forgot to include one of them in the picture. 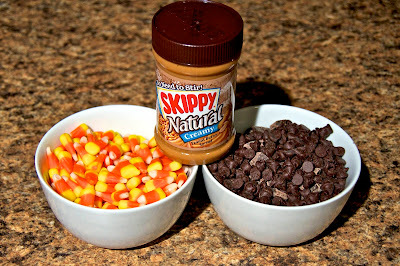 You need a 16 ounce bag of candy corn, and equal amount of peanut butter (16 oz), 3 cups of semi-sweet chocolate chips, and 1 tablespoon of shortening. If you think the ingredient list is easy, wait until you realize how simple these are to make! I put my candy corn in a pot over medium heat, foolishly thinking this was a great way to melt the candy. You see, candy corn is sticky. And it will stick to your pot. Instead of repeating my foolish mistakes, learn from them. Melt your candy corn in a microwave-safe bowl instead. I suggest nuking in 30 second intervals, stirring after each, until the candy is melted. 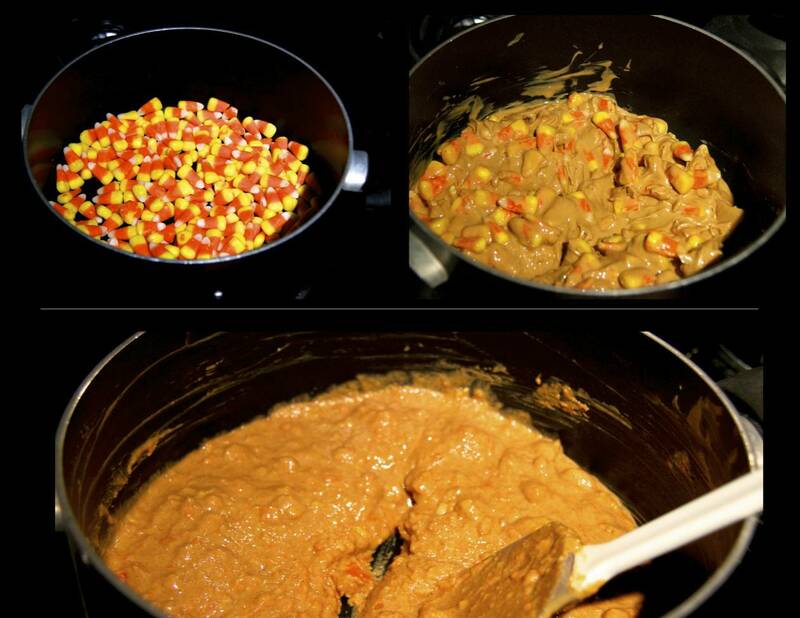 Once your microwaved candy corn is all gooey and melty, then stir in your peanut butter. It will resemble the bottom photo at that point. Next? Line a pan with wax paper. I used an 8x8 pan, but I think my candy bars were a bit on the thick side. A 9x13 pan might be a tad too thin. Use your own judgement here, and go with what works for you. Set the pan in your fridge for about 30 minutes. You don't want the candy to be rock solid, because then it will crack when you slice it. Shoot for a firm texture. While the candy is in the fridge, do two things. First, line a cookie sheet with wax paper and keep it handy. Second, melt down your chocolate chips. Add them, along with your shortening, to a double boiler (if you don't have a double boiler, you can create one by placing a bowl atop a barely simmering pot of water). Stir continuously until the chocolate is smooth. When the candy is chilled, pull your pan out of the fridge and slice into bars. Or whatever shape you prefer. But for the sake of argument, I'm going to use the word 'bars' from here on out. Piece by piece, dip your bars into the melted chocolate. You can use a candy dipper set, or you can be like me and just use a fork. Shake off any excess chocolate, then set the bars onto your wax paper-lined cookie sheet. Repeat until all your bars are covered in chocolate. 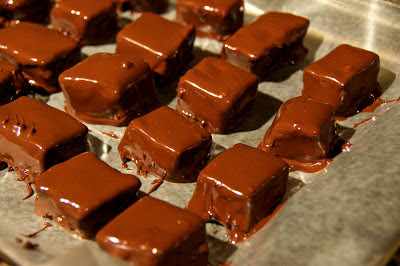 Place the bars back into your refrigerator to help the chocolate harden. This shouldn't take long, maybe 20 or 30 minutes. And then eat! And realize that I am right... these taste just like real Butterfingers! But try not too eat too many at once, ok? The Hubs can verify: too much sugar all at once will send you high, and then send you crashing back down. So my friends, what have we learned today? I think the lesson is that my candy corn purchasing compulsion isn't an all bad thing! No, you don't agree? That's ok, we can agree to disagree on this. However, when you find you've given in to the same compulsion, and don't know what to do with all that leftover candy corn, remember this recipe. It's an excellent way to take care of that problem for you. Melt your candy corn in a microwave safe bowl at 30 second intervals. Stir every 30 seconds until the candy corn is melted and smooth. While it’s still warm, stir in the peanut butter until combined. 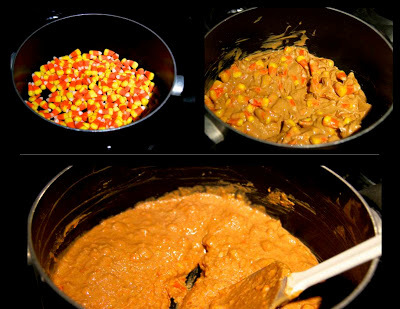 Spread the candy corn/peanut butter mixture into a baking pan lined with wax paper. 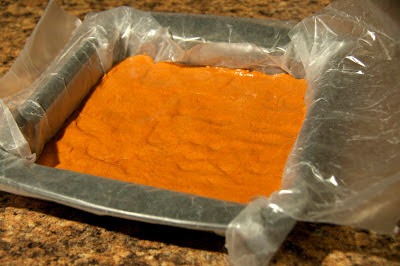 If using an 8x8 pan, the final candy will be thicker, a 9x13 pan and the candy will be much thinner. Chill candy in the refrigerator about 30 minutes. Once chilled, remove the candy from the fridge and cut into the desired size and shape. Bars are popular. Add your chocolate chips to the top of a double-boiler along with the shortening. Melt over low heat until, stirring constantly, until smooth. Line a cookie sheet with wax paper. 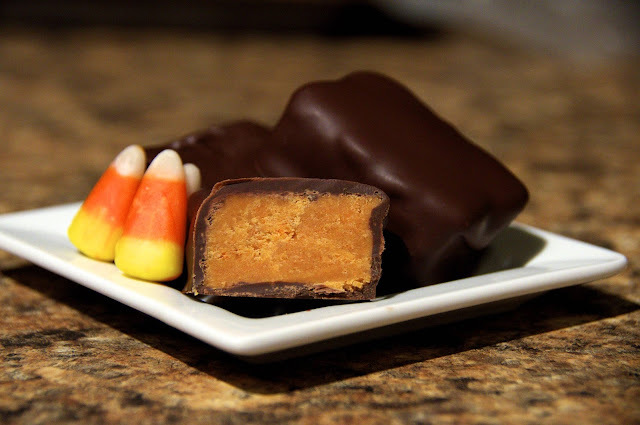 Dip your candy bars into the chocolate, shake off the excess, then lay onto the wax paper. Repeat with all the bars. Place in fridge until chocolate hardens and cools. Yum yum yummmmmmmmmm! I was trying to sneak a few Allie sent me home with just in time for my hubs to come home! He knew something was up when I didn't immediate ask, "Hi honey! How was your day?" BUSTED! But worth it!